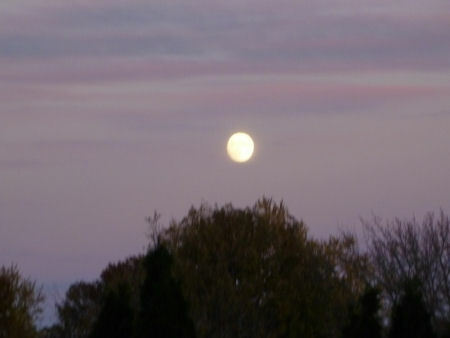 An almost perfect full moon in a pink and purple sky. I thought it too lovely not to share! Today we have spitting rain, blustery winds, and grey skies. Can Ole Man Winter be far behind? Why doesn’t Fall stick around a lot longer? 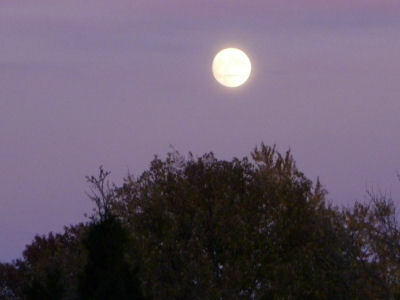 By the way, November’s full moon is referred to as the Full Beaver Moon, or the Frosty Moon, take your pick. This entry was posted in Seasonal and tagged Beaver Moon, Frosty Moon, Full moon. Bookmark the permalink. Frosty moon sounds better, pretty either way though! Thanks, Suzi. I could hardly believe how HUGE it looked! I see the moon and the moon sees me! Lovely picture of the Full Beaver Moon. I managed to get a glimpse between the clouds. Glad you got to see it, too, Kb — it was spectacular, wasn’t it?! The moon is amazing tonight in my sky too. I didn’t know there was a special name for it, but it sure is big and beautiful! Thanks, Terri. I wasn’t sure there was a special name for it, either, but I figured that if there was such a thing as a Blue Moon, Harvest Moon, and the like, maybe this one had a name, too. Who knew?? Debbie, being such a HUGE lover of the moon, I REALLY enjoyed these shots. I love the moon whether it’s half-full, crescent, or even covered in a blanket of clouds. However, there is nothing more beautiful than a FULL moon on a clear night. Thanks so much for sharing, my friend. Have a super weekend! I feel akin to the moon, too, Ron (must be in my natal horoscope!) I find myself unable to quit staring at it, especially when it’s full and the night is clear. It’s almost magnetic!! Glad you came along to enjoy it, too. Isn’t this return to “normal” time awful, Janna? I remember working in an office and driving home in the dark — wasn’t my cup of tea! I much prefer the dark being in the morning, though evening dark sure made it easier to buckle down and do homework as a kid! Well, poetically speaking, I prefer the name, Frosty Moon. Beautiful pictures. What a spectacular sky! Thanks, Monica. “Frosty Moon” is a pretty name, but I dread the thought of all the cold that’s sure to be on the way. “Beaver Moon” is a term I hadn’t heard before, but I rather like the image of those little rodents busily preparing for winter! Do you know if werewolves come out for that moon? *laughing* I wouldn’t be a bit surprised! Of course, perhaps they might wait until it gets a bit darker outside?! Definitely. I bet you’re right. God’s handiwork! Thanks for the view! He must have had fun putting together such a beautiful sky — glad you came along and enjoyed it! Glad you enjoyed it, dear Kim — did you get to see it in your part of the world? ?